A railway company in Osaka Prefecture has launched the “Gaijin-only” carriage to reduce inconveniences for normal passengers. Foreigners will be required to sit at the back of the train on the last carriage in their “rightful place” where there is expected to be wild parties during random times of the day. 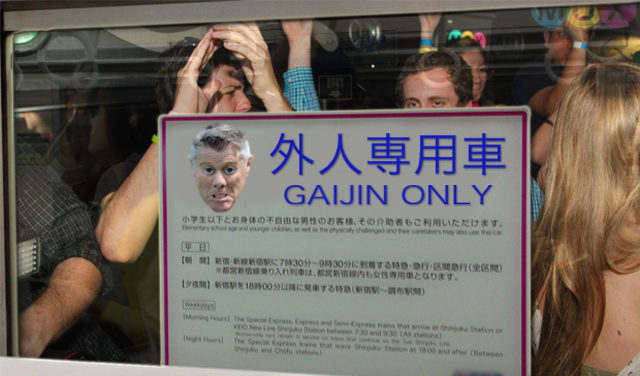 “The gaijin carriage will basically be one non-stop party where there will be a noticeable lack of decency and general manners,” said the railway spokesman. Train platforms will have no markings for gaijin carriage doors with foreigners being unfamiliar with the custom of making queues. Offering one’s seat to elderly women is decent and polite the world over, are you saying the Japanese don’t do this? Yes. That is it exactly. Strangely, very polite etiquette exists in Japan in everywhere you go….except on public transport. I remember being 34 weeks pregnant with a large suitcase on the train and young uni students and businessmen were sitting in the priority seats. They did not get up for me or anyone else who was old, pregnant, disbled or with a baby. After I finally got a seat and it was time to get off, I saw a teenage boy, about 18-19 years old, try to elbow his way past an old lady to get to it. It was the same everywhere, on buses and trains. I’m a white male, a month shy of 60 and last week a young woman offered me her seat on the subway. Here in Kyoto, people offer their seats to the elderly and other priority qualified passengers all the time. I feel cheated, I want my last-carriage parties! This story doesn’t mention the Gaijin safety zone of a least one empty seat on each side of them on the train, and if crowds are pushing you too much and you must sit next to a Gaijin, be sure to turn you body and head away from them at a 45 degree angle. This can’t be true. This is not Osaka. Everywhere says 専用車 is a private car, so it seems correct, just like 自転車専用道路 is bikes only. this post is not true. I live in Osaka for 23years,I never see it. Of course it isn’t, this website writes only satirical pieces. This article is making fun of the announcement that happened on an Osaka train, apologising for the inconvenience caused by foreign passengers. Perhaps Abe should get a team together to research why Japanese people don’t seem to be able to understand sarcasm and irony. All the while they find people making weird faces absolutely hilarious – I just don’t understand. It seems to mainly be the younger generations that have this sense of humor, potentially due to the quality of comedy on Japanese TV. This is segregation it was wrong in the past and it’s wrong now! I don’t know what’s funnier about the Rising Wasabi, the articles, or the triggered commenters thinking the stories are real. Fake news but real fools….